If you have ever dreamed of starting your own business and becoming your own boss, you’ve taken the first important step by selecting this book. It will show you what it takes to become an entrepreneur and how to find ideas to start your own business. Once you have selected an idea, you’ll have to find out if you can use it to create a viable business. This book will help you find ways to conduct your market research. Next, you’ll have to find out how much money you really need to start your business and whether you can self-finance it or if you will need to seek "love money" from friends or relatives. New businesses can gobble up your capital very quickly and it’s important for you to exercise controls over your costs and to manage your cash wisely. A whole chapter will help you do this. You may be able to operate your business out of your home or apartment. Find out some of the advantages and some of the disadvantages. Next, take a look at some of the legal and tax aspects of running your own business. Should you operate as a proprietorship, a partnership or incorporate? Learn how to protect your ideas or inventions. Find out what’s involved in registering for sales taxes. If you are going to hire employees, you’ll be shown ways to encourage them to do their best for you and get them to help you grow your business. Advertising is crucial to the success of your business and you’ll find a lot of advice on how to advertise both online and offline, plus ways to evaluate what is working best for you. Every business needs a business plan. If you haven’t figured out where you are heading and how to get there, you will be in trouble right from the get-go. A business plan will provide you with a map to success. You can obtain a lot of self-satisfaction from being your own boss and running your own business but you will have to acquire a lot of skills very quickly in order to succeed. Hopefully, this book will alert you to some of the things you will need to know and provide you with a lot of insight, based on first-hand experience, of how to handle the challenges which you will certainly have to face. You will find that this book is a great introduction to getting started as a successful entrepreneur. Introduction: Have You Got What it Takes? Chapter 1: Why Do People Become Entrepreneurs? Chapter 2: Find a Need! Chapter 4: Do You Have Enough Money to Start? Chapter 6: A Home-Based Business? 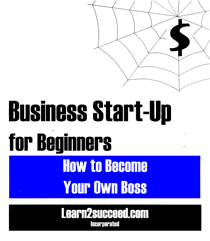 Business Start-Up for Beginners: How to Become Your Own Boss by: Learn2succeed.com Incorporated: Softcover; 116 pages; ISBN: 978-1-55270-444-8 published in 2012; $19.99.